The best way to celebrate a future Firefighters birthday is to throw them a Firefighter theme party. Below you will find a large selection of firefighter hats, firefighter decorations, photo props and even tableware to amaze your guests! 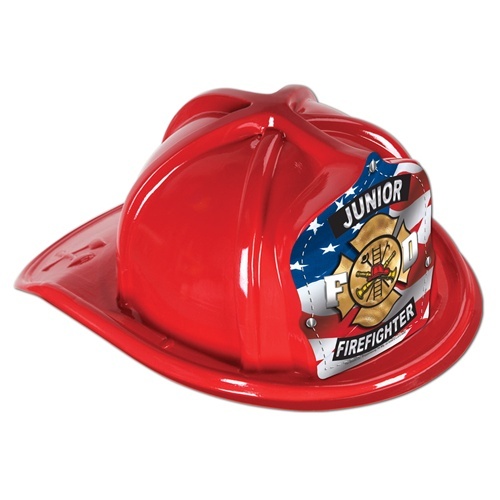 Help your little firefighter celebrate their birthday with our huge selection of firefighter party supplies. Don’t know where to begin? Browse our website and within minutes you’ll be full of creative ideas that are sure to please! No matter what wild and fun ideas you might have, when you party with PartyCheap, we’ll be sure to have all of the firefighter decorations you need for an easy and convenient one stop shopping experience! Throw a fire truck birthday party theme for the little boy or girl who wants to be a firefighter when they grow up. Mix and match our many firefighter party ideas to put together a party as large or small as you need. Serve cake on a Fire Truck Plate and wash it down with a Fire truck cup. For a really unique birthday party activity set up the Fire Truck Photo Prop and take turns getting your picture taken as your little firefighter stands behind the screen. No firefighter themed party would be complete without red fire hats. We also have firefighter hats in yellow, white, and black. Additionally, dressing up as a firefighter is a great way to go all out for Halloween. We hope you have as much fun planning a fireman themed party as the kids do playing at it. All of our firefighter birthday supplies can be used for general playtime so load up on our fireman party supplies for party time or fire truck playtime! These products are also a great teaching aide for children. Pass out a variety of these products to your students while teaching them about fire prevention. They’ll be more excited than ever to learn about fire prevention when they’re wearing their brand new firefighter party supplies. So the next time you’re in need of some fireman party supplies, party with us as PartyCheap.com! Bulk discounts are available to meet every party budget!